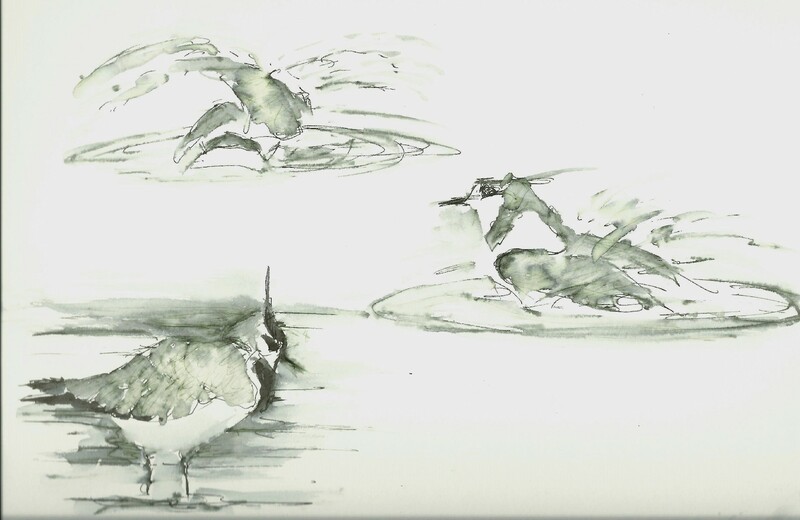 It is a challenge to pick out shapes, tones and movements from a shifting flock of birds. One image is so rapidly replaced by another. I wonder whether this is similar to the confusion of a waiting predator, struggling to identify and focus on an individual in a herd amid a myriad of fast changing patterns. Standing in strong light from the left. 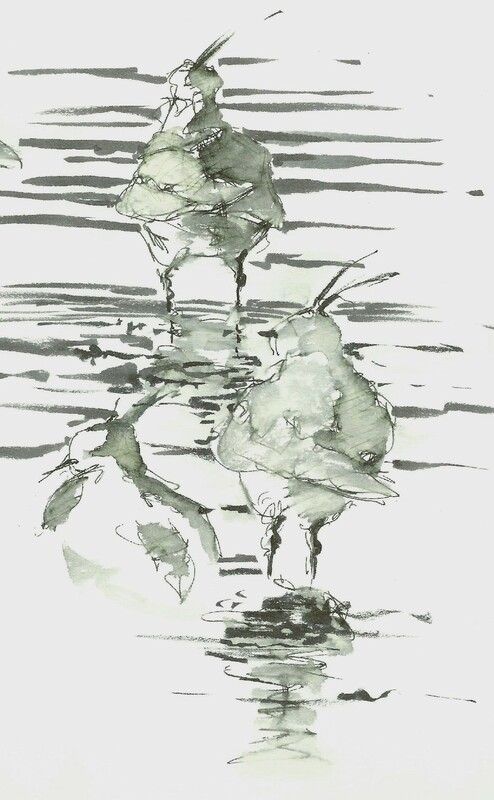 Every ten minutes or so, the whole flock would take off and weave in something close to formation, now above the tree tops, now careening down across the water surface. I could follow individuals through binoculars, but holding images as a series of frames and putting this on paper was beyond me. Here birds are mostly coming back in to land. 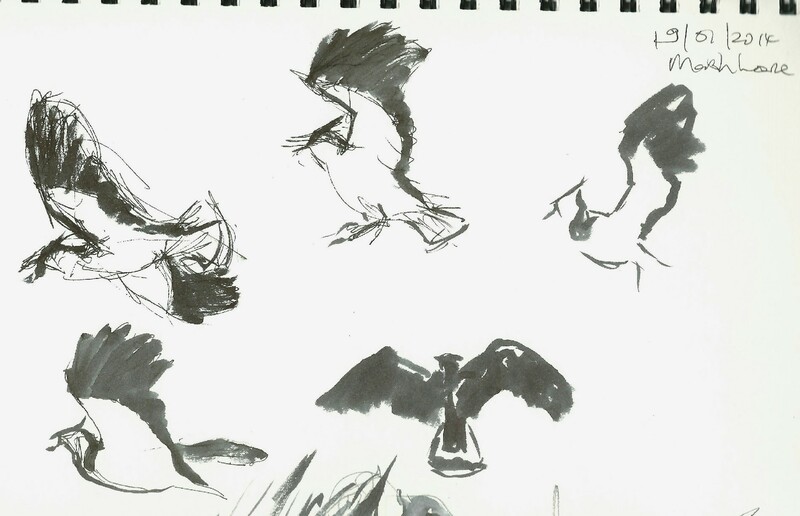 I need to take a different approach to sketching, not trying to capture a still frame as a final sketch but instead collecting information piecemeal: the shapes made by the flock in flight, the synchrony or otherwise of wing beats (see this front cover to the scientific journal Nature last week), the positioning of the heads, tails and feet, the shapes of wings, how the shadows fall … I can try to use printmaking as a secondary medium to pull these data together into an image. 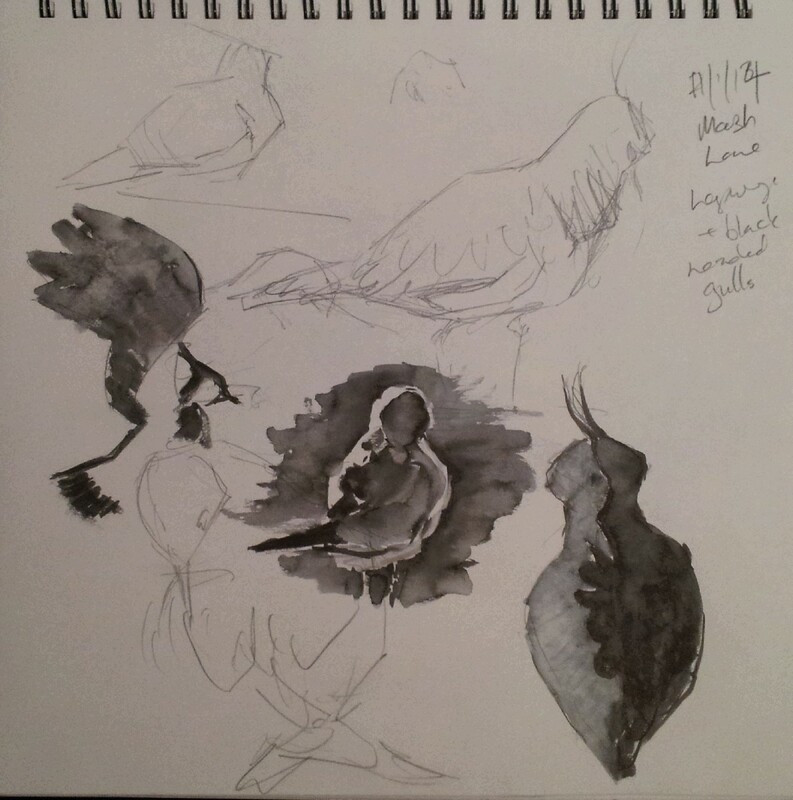 Here by contrast are quick sketches of the shapes made by a sleeping heron. Ten months ago I stood in the sleet and mist on the rocky path that leads up the side of a steep drop that had been carved by falling water powered by the melting Ice Age glaciers. 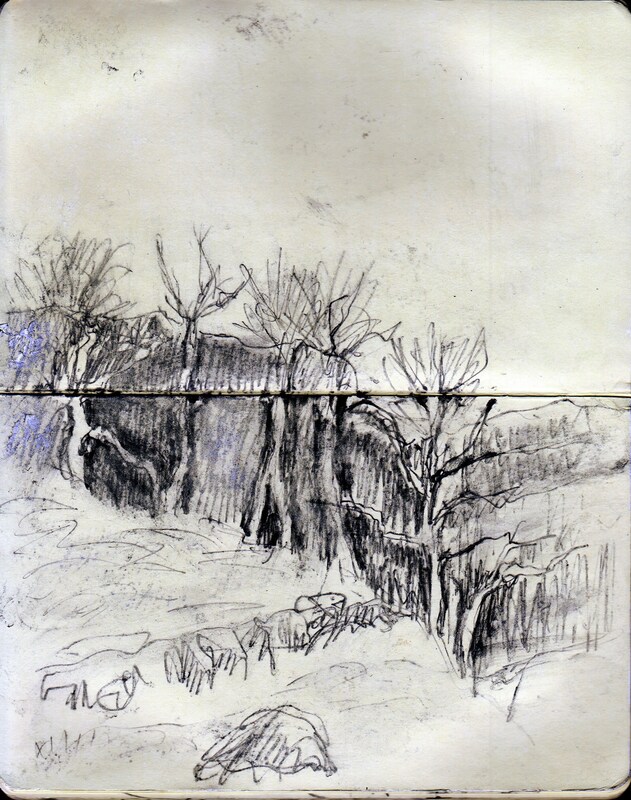 I have adapted this sketch, experimenting with carving a relief into a soft cut rubber block. The aim was really to understand how the tools worked this material. It was like butter against the broad bladed gouge yet buckled and resisted the greater pressure applied from the narrow V shaped cutter. It took a while to learn how to cut fine lines. This was the first cut. 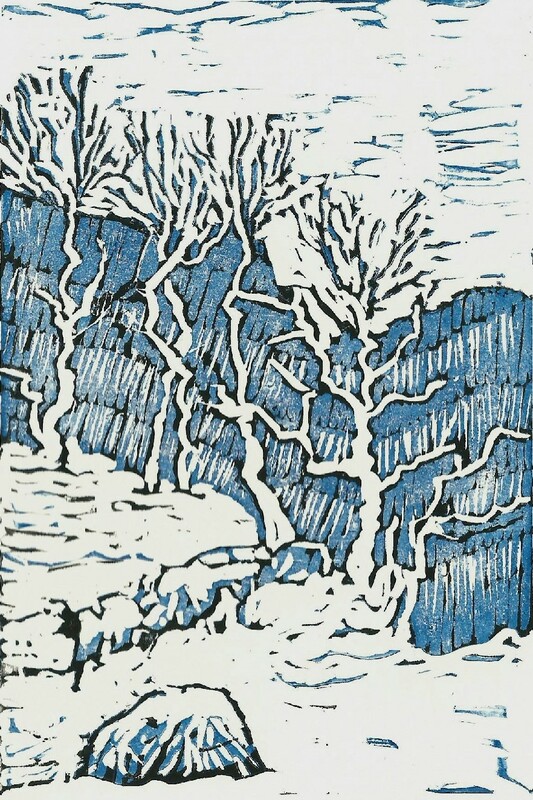 Those small white vertical lines seemed to say nothing about the rock structure beneath, so I made four prints with various depths of blue and then recut the block. 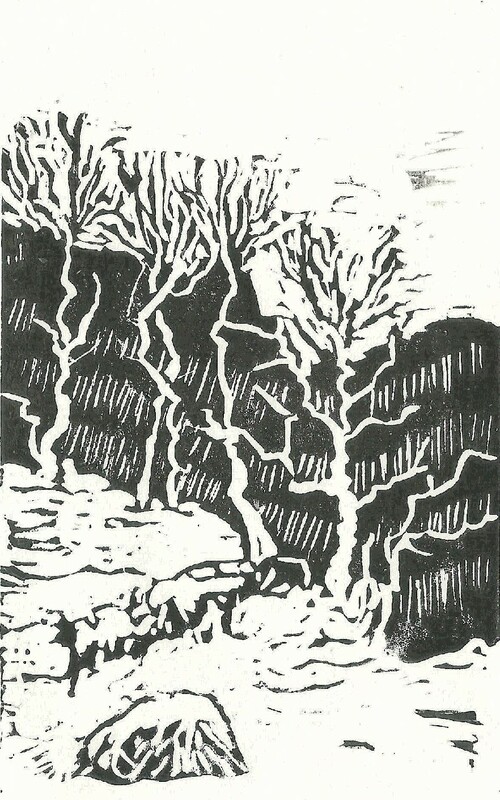 Actually, I quite like this simple image without the blue underprint. To me, it has a pleasing abstract nature. Printing was done on the floor with an eighteen stone weight applied to the paper and block: i.e. placing a dictionary on the paper, with me standing on the book, lifting my daughter and with my son balancing on my feet and holding onto hers. 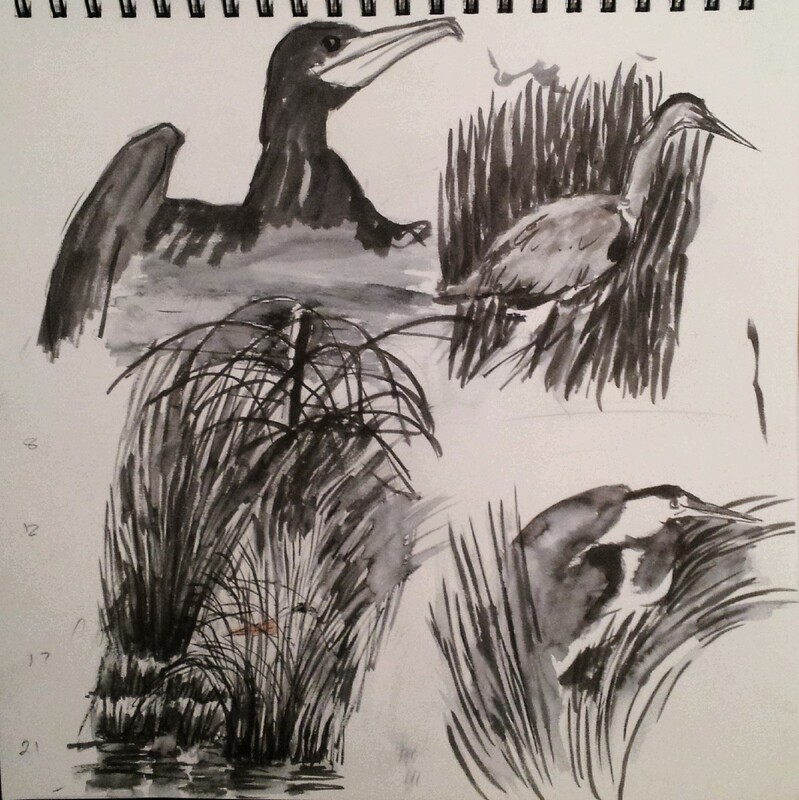 I cycled down to the nature reserve and drew for a couple of hours, for the first time in a few months. These sketches are below and on the previous post. I painted the watercolour the same evening based on my sketch, my memory and crude shots taken with my phone pointed down the telescope. 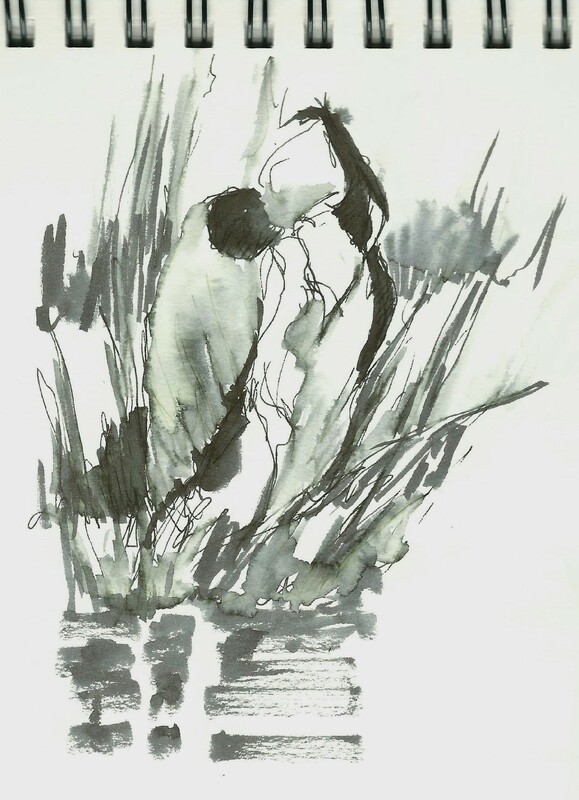 The important components are the dark shadows and bright highlights on the reeds and long grass. I started with too much raw sienna and had to claw back the white paper with a knife. I might try this composition again, and if so, will reserve large chunks of white paper from the start. I greatly admire this blog. Marc Holmes is an artist in Montreal doing concept art and illustration for games, books and films. 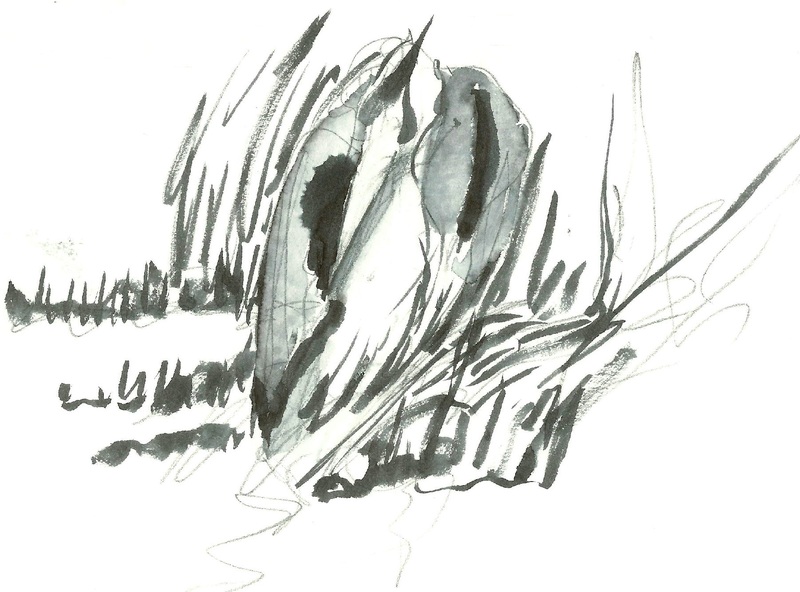 In his sketchbook, his lines in soluble ink are liberated with the brush to produce dynamic and expressive images. Would that I could do the same. He commented on the use of the Lamy extra fine Safari fountain pen and the Kuretake brush pen and I bought them on this recommendation. The Safari delivers lovely clear fine lines with no choking up like my old Parker fountain pen. The brush pen with either the nylon or sable tip (I bought the one and was given the other) gives a steady ink flow with the control and flexibility of the brush. These are great items in my simple field drawing kit – making clear versatile marks for a small burden. 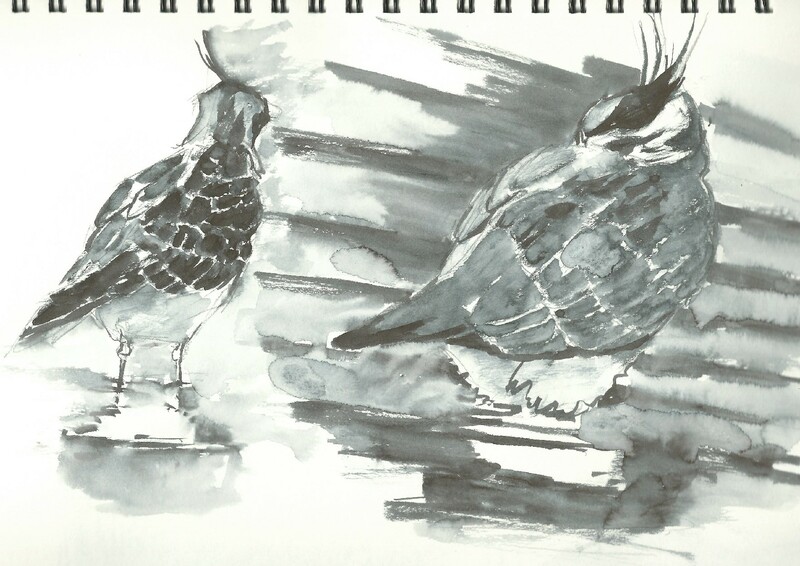 This was my first field use of these two tools for drawing birds. 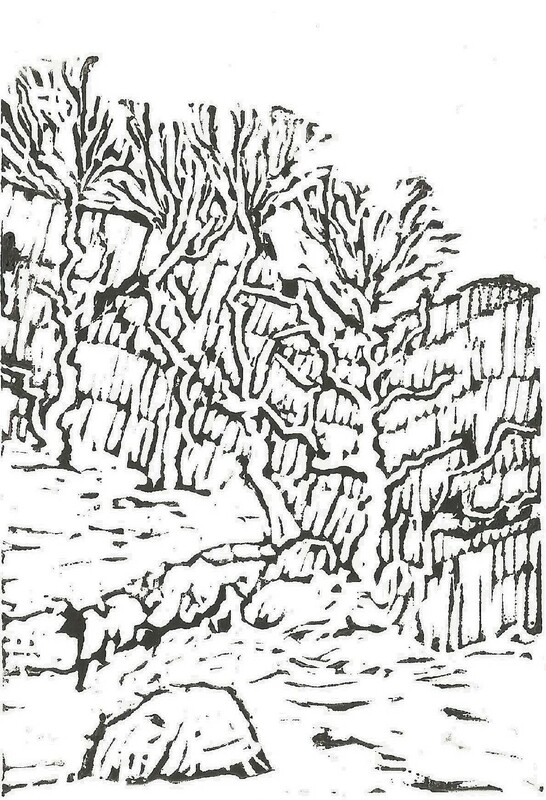 I also used a sable brush and clean water to work into the sketches after making the initial marks rapidly in the brush pen. Marc comments on taking a couple of vials of crimson and blue stained water to melt the lines and I may try this.